A protester with tape saying "Unheard" over his mouth, a reference to the minority rights student group that organized Monday morning's protest of the Sigma Alpha Epsilon chant video. A protester holds a sign during Monday morning's demonstration. Demonstrators gather outside Evans Hall on the University of Oklahoma campus Monday morning to protest the video with racist chants allegedly by Sigma Alpha Epsilon fraternity members. Students gather Monday morning outside the University of Oklahoma's main administration to protest a racist video reportedly made by Sigma Alpha Epsilon members. KGOU's Kate Carlton Greer reports for NPR's "All Things Considered" one of America's largest college fraternities, Sigma Alpha Epsilon, closed its chapter at the University of Oklahoma late Sunday after a video posted hours earlier appeared to show fraternity members singing a racist chant. A top high school football recruit has de-committed from the University of Oklahoma after several members of a campus fraternity participated in a racist video. Jean Delance is a junior at North Mesquite High School in Texas. He told CBSDFW he would not attend Oklahoma. In the television interview, Delance described the video as "very disturbing" and described the people in it as "uneducated." Earlier Monday, members of the Oklahoma football team chose not to practice and instead walked arm-in-arm, wearing black, in silent protest after several members of a campus fraternity participated in a racist video. Players also took to social media to voice their displeasure. A school spokesman said the team and coach Bob Stoops agreed to protest instead of practicing. Stoops walked front and center at the team's indoor practice facility, and athletic director Joe Castiglione joined the players. Four members of Oklahoma's black caucus praised University of Oklahoma president David Boren for his swift reaction to videos that appear to show Sigma Alpha Epsilon fraternity members singing a chant with racial slurs and derogatory references to lynching African-Americans. Shelton said he wasn’t surprised that racist attitudes still exist in Oklahoma. Oklahoma's chief executive and senior U.S. Senator say they support Boren for his reaction to the video purportedly showing OU fraternity members engaging in racist behavior on a charter bus. I stand w/ @President_Boren that racism will not be tolerated. I applaud OU for its swift response towards SAE's deplorable actions. Inhofe filled Boren's Senate seat in 1994 when he stepped down to lead the OU. He's been re-elected to four full terms since then. Gov. Mary Fallin said the comments in the video do not represent Oklahoma or University of Oklahoma values. "As the outrage among Oklahomans has demonstrated, we are a state that does not tolerate that kind of disrespectful behavior," Fallin said in a statement. Fallin said she appreciated the swift reaction by Boren, who is one of her predecessors in the state's highest office, as well as the reaction of OU faculty, staff, and students. A second video has surfaced, from a different angle, showing the racist chant on a charter bus allegedly involving members of the University of Oklahoma's chapter of the Sigma Alpha Epsilon fraternity. David Smith observed on his Instagram page a second student appears from the background and motions toward the camera, as if to wave it away. Students sang and listened to speakers on the North Oval in front of OU president David Boren's office Monday. Accounting student Naome Kadira told KGOU's Jacob McCleland she thinks the punishment is appropriate, but more needs to be done. Hundreds of students gathered this morning on the University of Oklahoma campus to protest a video of members of the Sigma Alpha Epsilon fraternity chanting racial slurs. The recording showed SAE members on a bus - singing a highly-derogatory racist chant that also included a phrase about lynching, and said no black people would ever be admitted. OU senior Samuel Iroanya told KGOU's Kate Carlton Greer the video is just a glimpse of the discrimination that sometimes occurs on campus. "Unfortunately it took something this big to make our campus aware that the things we're talking about are not just issues we're sitting at home making up," Iroanya said. "They're issues that actually do exist and racism is alive, so we have to stop acting like we don’t see the big elephant in the room." While an investigation continues, some students like Delatrice Staley say the closing of the chapter isn’t enough. She’s frustrated that some want to suspend – instead of expel – the fraternity members for using such harsh racial language. Staley worries that even with severe punishment, discrimination will continue at OU. That’s something both students and university administrators have to grapple with now. The fraternity's national spokesman Brandon Weghorst told McCleland the board of directors didn't even hesitate to close the chapter. "This is something that we will not accept and we do not need this type of behavior in Sigma Alpha Epsilon," Weghorst said. "It is completely inconsistent with our values." University of Oklahoma president David Boren says the Sigma Alpha Epsilon fraternity won’t be back as long as he’s president of this university. During a Monday morning news conference, Boren said OU’s legal office is examining what else can be done by the university to the SAE members featured in the video of a busload of students chanting racial slurs against African-Americans. Boren said OU’s non-discrimination policy is based on Title VI of the 1964 Civil Rights Act, meaning it could be possible to take action against the individuals involved. It’s not the first time Sigma Alpha Epsilon’s chapter at OU has been under scrutiny. The Oklahoma Daily reports the fraternity received a two-year suspension 25 years ago for hazing, and returned to their house at 730 College Ave. in early 1996. The national fraternity in Evanston, Ill., revoked Sigma Alpha Epsilon's charter on Nov. 8, 1989, following allegations of physical and mental harassment, alcohol misconduct and violation of state laws. The national fraternity recognized the group as a colony in the fall of 1993. The colony, which does not have a charter, moved into a house at 601 Cruce St.
Members will move into the former Sigma Alpha Epsilon house at 730 College Ave. Jan. 10. University of Oklahoma president David Boren says all ties have been severed between the school and the Sigma Alpha Epsilon fraternity, and members living in the SAE house on College Ave. in Norman have until midnight to remove their belongings and vacate the premises. "To those who have misused their free speech in such a reprehensible way, I have a message for you. You are disgraceful," Boren said in an email to students, faculty, and staff. "You have violated all that we stand for. You should not have the privilege of calling yourselves 'Sooners.'" 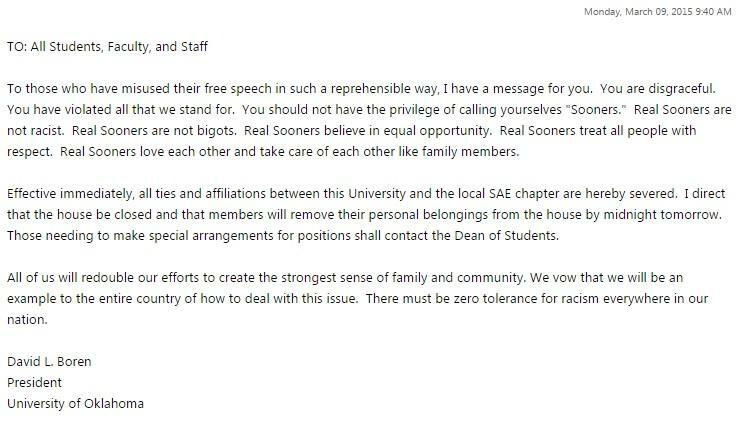 University of Oklahoma president David Boren's email to the OU community after a viral video showing a racist chant by Sigma Alpha Epsilon fraternity members surfaced Sunday evening. A student moves clothes and other personal belongings out of the Sigma Alpha Epsilon house Tuesday morning. Demonstrators gathered on the North Oval of the University of Oklahoma's campus Monday morning to protest a video that went viral Sunday night showing fraternity members engaging in a racist chant. Speaking to reporters and a crowd gathered just outside of his office, OU President David Boren called the actions of members of Sigma Alpha Epsilon "despicable." "[In] 20 years I have not seen anything that has so deeply troubled me as this," Boren said. Students gathered before sunrise with tape over their mouth that had the word "Unheard" written on it – a reference to the minority rights student group that organized the protest. Boren said he hopes the incident serves to educate OU's students, faculty, and staff. "I always look, even in the worst of circumstances, to find a learning experience,” Boren said. “All I can say is it makes us want to redouble our efforts to create a community that will be an example to the rest of the country." The incident reportedly occurred on the same weekend demonstrators gathered in Alabama to mark the 50th anniversary of violent "Bloody Sunday" protests that occurred in 1965 on a bridge in Selma. The fraternity's national headquarters said the OU chapter would close immediately. The video of the chant. WARNING: Offensive language. SAE said Sunday night an investigation had confirmed the contents of a video showing multiple people chanting a racial slur against African-Americans, and indicating that blacks would never be admitted to the fraternity. The chant also references lynching. The Sigma Alpha Epsilon house at the University of Oklahoma before dawn Monday morning. Police officers surrounded the fraternity house as students were seen moving belongings out Monday morning. OU President David Boren called the behavior “reprehensible" and contrary to the university's values in a statement Sunday night, and said the fraternity's chapter would no longer remain on campus if the reports turned out to be true. The video was first posted online by a minority rights student group at OU. They plan to lead a protest at 7:30 Monday morning on the campus' North Oval.